When the cold weather and snow struck this week I knew that it was time to make some hot chocolate. 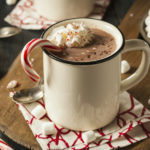 A cup of Instant Pot Blender Hot Chocolate topped with whipped cream and ground peppermint sticks. No, I am not talking about the packs of pre-packaged powder hot chocolate with the tiny dehydrated marshmallows. Don’t get me wrong, I definitely have made my fair share of those little packets myself. But with the first real snowfall of the year coming down, I wanted to make homemade hot chocolate. You know the kind. It’s thick and creamy and every sip tastes like you are taking a bite into a chocolate candy bar. 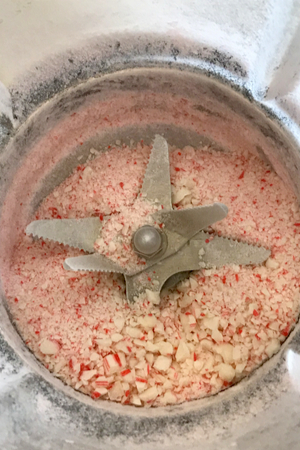 I used candy canes to make my ground peppermint candy. When I began to gather my cocoa powder from the cupboard, I glanced over at my counter. There she sat – my newest Instant Pot appliance. It was time to give Instant Pot Blender Hot Chocolate a try! I have used my Instant Pot Ace Blender to make soup, smoothies, almond milk and ice cream. 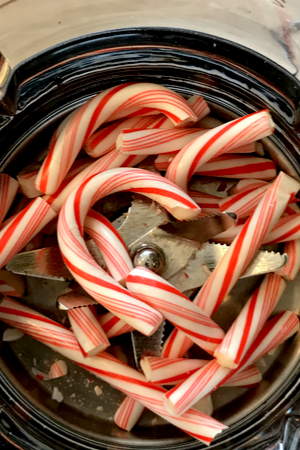 It took only a few seconds to grind the peppermint sticks. But I not yet made a hot beverage in it yet. Now was the perfect time to try! It was cold, I needed something to warm my bones, and I didn’t want to stand over the stove stirring a pot. I grabbed my typical ingredients that I make homemade hot chocolate and gave it a whirl. First of all, I put some candy canes in the blender to use both in the hot chocolate and as a garnish on top. Luckily I had some extras from a holiday party from the weekend before. I used my typical homemade hot chocolate recipe but made it in the blender. I had never used my blender as a grinder before so I was hesitant to see the results. Within 3 seconds on the low setting, I had ground peppermint sticks! I took about half out for the garnish and kept the rest in the blender. Next I added my milk, chocolate chips and cocoa powder. To make Instant Pot Blender Hot Chocolate I used the puree button and set it for the soft food setting (mode 1). Within just a few minutes I had hot chocolate ready to be served! No waiting for the pot on the stove to come to a simmer, and not stirring the pot to make sure that the milk didn’t scorch the bottom of the pan! When I poured out the last drop of the hot chocolate into the mugs, I noticed that on one half of the bottom of the blender a little milk had stuck to it. I wanted to quickly get this cleaned up before it cooled completely. So I ran the cleanse cycle and used the brush that came with the blender. That took about half of it off, but there was still some that needed to be cleaned. All I had to do was pour in a little Bar Keepers Friend and wipe it down with a dishcloth and it was back to looking new again! Without having any canned whipped cream in the house, I had to resort to making my own. I put my mixing bowl and whisk attachment in the freezer. Once cold I was able to make a batch of whipped cream using heavy cream, sugar and vanilla. Added that to the top of the mugs and sprinkled on the rest of the ground peppermint sticks. And that, is how I made Instant Pot Blender Hot Chocolate! To receive our3 Recipe Articles in your inbox each week, sign up for our free email list. 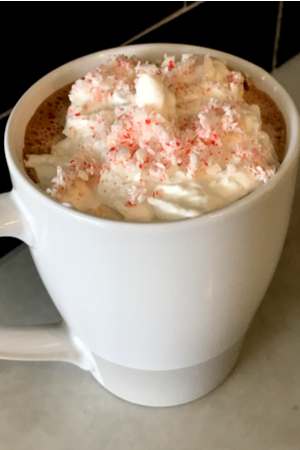 Thick and creamy peppermint hot chocolate made in the Instant Pot Ace Blender and topped with whipped cream and peppermint powder. Place peppermint sticks into the Instant Pot Blender and secure lid. Select Low and let grind for approximately 3 seconds or until it is ground to the desired consistency. Remove half of the ground peppermints and set aside. 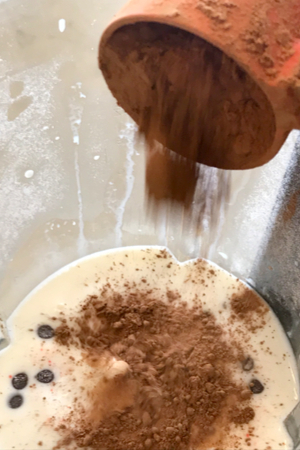 Place milk, chocolate and cocoa powder into the Instant Pot Blender along with half of the ground peppermints and secure lid. Select Puree 1. *You must push the puree button twice until the display reads 1. Once the Instant Pot Blender is done, carefully remove the lid and pour into coffee cups. Garnish with whipped cream and reserved peppermint and serve immediately.